Since its earlier periods, The Ottoman Empire has established intense relations with European states. Urged by curiosity and a certain degree of fear at times, the West’s efforts, on the other hand, to be acquainted with and understand this government of immense military power and source of political authority, emerged as a political exigency. Undoubtedly, the encounter of markedly different cultures bore the most enduring fruit within the realm of arts. Wars, the increase of trade as a means for mutual prosperity, and conflicts of status were the most significant factors behind the intense traffic of diplomacy. Sprawled across a vast geography, the Ottoman Empire welcomed more ambassadors than it sent to other countries, and particularly until the 19th century; these ambassadors were embraced, per Ottoman tradition. In turn, western ambassadors were prompted by the need to document the cities, particularly İstanbul, social structure, customs, administrative and military organization of the Ottoman Empire; apart from the reports they drafted upon their return, they also took advantage of the gifts and paintings they carried along. Often presumed to be true-to-life visual documents, such paintings thus became the most evident expressions of respectability and social status, and attained a special place and meaning, partly due to their potential to address the masses. The works that ambassadors commissioned to artists they added to their retinue en route to the East or to their local counterparts they encountered during service, evolved into books with engravings or collections decorating the walls of European chateaus, and served as source material for works by other artists, thus generating a large visual repertoire on the Ottoman world. Ottoman ambassadors sent to European countries were subjects of monumental portraits painted by leading European artists of the period, immortalizing these historic visits. This selection from the Suna and İnan Kıraç Foundation Orientalist Painting Collection, not only allows us to travel across the meandering paths of diplomatic history under the guidance of art, but it also introduces us to intriguing personalities. Ambassadors and painters continue to communicate with us through a silent yet equally rich and colourful language of expression, presented in their reports and letters, and share with us their respective periods, worldviews, travels and experiences, as well as the ceremonies they joined. Listening to their extraordinary tales, it is impossible not to be enraptured by the splendor and elegance of a lost age. Often used as one of the clearest indications of status and identity in western art since Antiquity, portraits also served a similar purpose for ambassadors. Furthermore, documenting the physiognomy of ambassadors through portraiture was also regarded as a precautionary measure against espionage. Portraits were painted of European ambassadors sent to the Ottoman Empire as high-level officials that have attained great respectability; artists to which these portraits were commissioned strived to reflect not only the physiognomy of the ambassadors, but the power and authority of the state and the ruler they represented. The Ottoman State’s political, military, commercial, and cultural relations with European states gained momentum from the 18th century onwards. In turn, the visits Ottoman ambassadors paid to western countries accelerated the spread of the Turquerie fashion of the period. While portraits of Ottoman ambassadors painted by renowned artists of the countries to which they were assigned served to honor the Ottoman Sultan and his representative, they also nurtured the West’s penchant for exoticism. There is no doubt that the ever-changing trends, fashions, as well as the purpose of diplomatic visits and political relations were reflected in the portraits. For example, while Kozbekçi Mustafa Ağa, who was sent to Sweden to collect debts, is portrayed standing -like a western emperor-, Yusuf Agâh Efendi, who left for England in the late 18th century as the first permanent ambassador of the Ottoman Porte, is depicted entirely in an eastern pose with the rosary beads he holds in his hand against a western background. 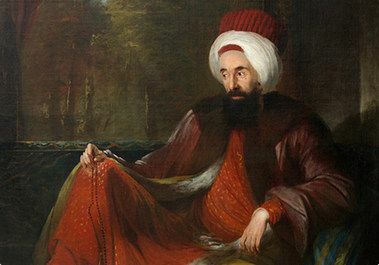 When French Ambassador Comte de Vergennes commissioned portraits of himself and his wife in Ottoman attire per the Turquerie fashion, he was depicted in an eastern pose, thereby clearly emphasizing that he served as ambassador in İstanbul. Paintings depicting the audience of European ambassadors at the Ottoman Palace constitute a special group of works that not only demonstrate a diplomatic event and reflect court traditions and officials in a range of attires, but they also act as portraits of foremost individuals, such as the sultan and the grand vizier. Borne directly out of and as a consequence of the realm of ambassadorial service, the best-known examples of this genre have been executed by Jean-Baptiste Vanmour. Paintings by artists under the patronage of western ambassadors mainly carried weight as visual documents at times, whereas in other instances, they were appreciated as works that commemorated this prestigious service, popularizing and transmitting the name of each ambassador from one country or generation to the next. It is possible to assume that the Ottoman scenes Hans Ludwig von Kuefstein -the Holy Roman Empire’s ambassador to the Ottoman Porte- commissioned were documentation-oriented works when they were initially executed. On the other hand, Recueil Ferriol, the book of engravings that Marquis Charles de Ferriol had published based on the paintings of Jean-Baptiste Vanmour had a considerable impact; not only did the book immortalize the ambassador’s legacy, but it influenced other artists with the subsequent editions released in different countries at different times. As of the 18th century, western artists living in İstanbul became an indispensible part of the European way of social life developed around the embassies in Pera. Conceived as a “”suburb of Paris,”” this western setting provided painters with a milieu from which they received commissions that enabled them to meet their social needs and thus sustained their life in İstanbul. The interest ambassadors such as Choiseul-Gouffier and Robert Ainslie had in the archaeology and picturesque views of Antiquity during the second half of that century, as well as the paintings they commissioned and books they published in line with their world view reflecting the ideology of the Enlightenment, appear to be competing with one another as the harbingers of 19th-century Romanticism. By the 19th century, western ambassadors assumed the role of patrons for Orientalist painters in İstanbul, such as Fabius Brest or Fausto Zonaro, who ventured out towards the exotic East independently of a diplomatic entourage. Similar, for example, to his painting that depicts British ambassador Sir Philip W. Currie’s daughter in a palanquin to be used on her wedding ceremony, Zonaro received commissions from ambassadors and ambassadorial circles prior to becoming Abdülhamid II’s court painter, and he was introduced to the Ottoman Palace by way of Russian ambassador Aleksandr Nelidov.